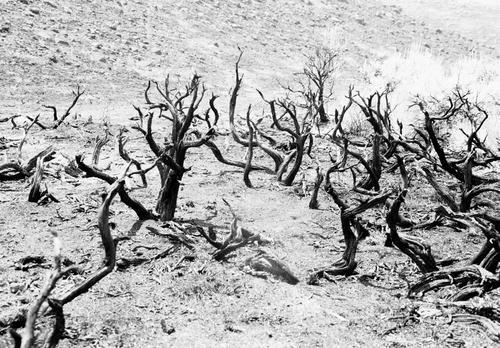 These large sagebrush were burned up during the Little Halfmoon Fire last week. The fire began with a lightning strike on Wednesday afternoon and was contained Thursday evening. Last week's wildfire just south of Halfmoon Mountain and adjacent to the road leading to Little Halfmoon Lake burned approximately 600 acres of mostly private land according to Sublette County Fire Warden John Blaha of Boulder. The burn area extends from the base of Half Moon Mountain south through Game & Fish and Christmann Corporation property. Glow from the fire was clearly visible from Pinedale Wednesday evening. The fire was started by a lightning strike around 2:30 p.m. on Wednesday. It was finally contained late Thursday evening. Fire crews were still sitting on the fire area Friday afternoon, waiting for the fire to be declared under control and finally "out." Twelve fire engines and one bull dozer responded to the original call, said Mr. Blaha. At its height on Wednesday, up to 36 fire fighters were fighting the fire, including 26 inmates who call themselves the "Smoke Busters" from the Wyoming Honor Camp in Newcastle. The Smoke Busters also responded to and fought the Half Moon Mountain fire a couple years ago. Every Sublette County volunteer fire department except Bondurant's were brought in to fight the fire. High, shifting winds complicated firefighting efforts. On Wednesday, shifting winds had the main head of the fire heading south, towards the Fayette Ranch, said Mr. Blaha. At the same time, winds had another side of the fire traveling northeast, along the road to Little Half Moon Lake. During the day on Thursday, Mr. Blaha said his crews thought they had the fire contained, "but a couple 40 mph gusts sparked it up again." The fire was contained later Thursday evening. Mr. Blaha re-emphasized that conditions in the county are extremely dry right now and urged residents to use common sense and caution in burning garbage or doing any other activity which could lead to a fire getting started. Along with complimenting the efforts of the county crews, Mr. Blaha said he appreciated the assistance he received from Forest Service Crews to fight this fire.